We send website newsletters every few weeks to our mailing list of past and present customers. In these newsletters we try to include advice on Christmas decorating and Nativities. We show pictures of new products and special offers as well as regular features of our website such as our free pictures and our Lay Away Plan. A few weeks after we ship a product we ask the customer to rate the product and our service, with both a comment and a zero to five star score. We receive some wonderful comments and we have published the best in our blog. We had one recently that we want to share with you. Husband Arthur built the stable; he’s been a building contractor and inspector. [The building can be dismantled for storage.] For several years now, we’ve wanted to add the 3 Kings…as well as cattle and/or a donkey, etc. Truth is, we just can’t seem to afford to do so. We have a HUGE family – growing by leaps and bounds – and by the time we plan gifts for those we MUST gift, there’s just nothing left for our outdoor display. We’d take you up on your “buy now, pay later” plan, but every January 1st we end up so “far behind” that this kind of planning doesn’t help us at all. WE DO keep your catalog and ads handy and – if and when we feel we are able – will be in touch to add pieces to our outdoor Christmas display. Thank you for keeping US in mind! A picture is worth a thousand words and the social media are proving it. This is a slow sales period for us but we are very busy unloading containers and photographing new items and adding them to our websites. We thought you might want to see some of us working and give you some idea of how our business functions. 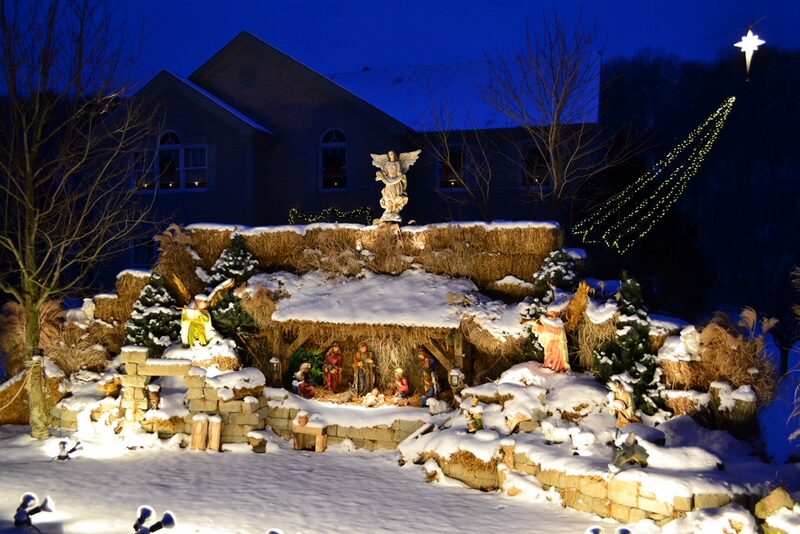 We have included images from both our Christmas Night and Saint Francis Garden websites. Claire in our photography studio, setting up lighting while watched over by the Nutcracker King with Scepter. soon to have his picture taken. As you can see we have a lot of fun with our inanimate friends. As a direct marketing business, selling mostly to consumers, we are constantly trying to identify and focus on what will please our customers and keep them coming back. The solid foundation for this effort is our set of values. This can be summarized quite simply as the paraphrased biblical “Golden Rule” Treat Others as You Would Like to Be Treated. Of course if we didn’t plan, organize and manage for profit we wouldn’t be around to please our customers. Here are the five things we do that we hope please our customers and keep them coming back. 1. Offer Christmas Products They Can’t Find Elsewhere. This is easier to do for Christmas Night because we maintain a sharp focus on large Christmas figures, primarily for outdoor. That means no tree baubles nor tree skirts and no trees either. Just Life Size Nativities, Nutcrackers, Toy Soldiers, Reindeer and other large figures associated with the celebration of Christmas. 2. Provide Superior Customer Service. I answered a customer call the other day and was happy to take an order for 27″ Nativity Set. When I asked the customer (as I usually do ) how he found us, he said we were number two on the Google page but we answered our phone and helped him, which the number one ranked store did not. The term “superior customer service”is a cliche these days as so many companies claim to offer it. Few companies follow all the way through as we do, even after delivery. 3. Offer Good Value. We don’t always have the lowest prices on our products, we offer free shipping on a limited number of products and we rarely discount our product prices. Nevertheless, the product reviews and customer comments seem to confirm that we provide good value. The items which arrive broken are replaced as soon as possible and defective items are repaired or replaced. 4.Maintain High Quality. We have replaced several suppliers who have let their product quality slip, we spot check our incoming shipments and we constantly work with our factories to improve molding and painting. Just past November 1 and our season is in full steam. Each year is unique and this season is no exception. Our new Toy Soldiers and Nutcrackers are selling very well as are the various Santa, Sleigh and Reindeer sets we put together for this year. Our larger than life and life size Nativities and Holy Families are in demand and we are having trouble keeping up with the orders for our Nativity Stables. Our Christmas and Artisan Nativities from Joseph’s Studio are starting to move well and this later action is normal for the smaller Nativity sets. What is surprising is the slow sales of our beautiful Fabric and Resin Nativity and 2D Wood Nativities. Watch for a promotion on these shortly! We wanted to share with you a wonderful testimonial that we received in September from a Church in South Carolina. We often talk with groups looking to raise the funds to buy a new Nativity scene for their organization, church, hospital, municipality or charity. They may be looking to replace a Nativity that they have had for years or they may be buying a Nativity Set for the first time. In this blog, we offer some steps and suggestions to help you and your organization achieve this objective. 1. Take advantage of our offer on our website under “Information Request”. Tick off the items that you want pictures and more information on , provide your mailing address and contact information and we will send you full color 8″x11′ photos of any of the sets requested, along with set data and shipping cost to your zip code. This will all be contained in an attractive presentation folder, which can be used at purchasing committee meetings or given to the decision maker. The photos are high quality and can be used to make posters and hand outs for group fund raising. 2. Successful fund raising may start with the identification of a potential benefactor. In a church or charity, this may be someone remembering a loved one, a long time supporter or congregant or a board member. This person may offer a contribution matching monies raised by the group or committee or they may provide the full amount. Remember to involve them in the process as much or as little as they want. They make the rules. 3. The keys in group fund raising is volunteers and communication. Create a committee with clear responsibilities , not just opinions and set some targets with timing and amounts. Critics and opinionated people can be challenged to either donate time or money to back up their opinions. Once an objective is agreed, the research becomes the most important next step. Use the internet search engines to locate Nativity alternatives, which are rarely available in local retail stores. 4. Once your group has decided which Nativity set to purchase, you will want to consider some money raising techniques. In a church, for example, these may include bake sales, silent auctions, “Christmas in July” and “Nativity Tree” and many other fund raising activities. Local businesses may want to contribute or the local municipality may have a budget for Christmas celebration. Charitable organizations may be able to obtain grants which match funds raised by the fund raisers.. This is an exciting and busy time of year for us. Our warehouse staff is working hard unloading multiple steel shipping containers containing boxes of our products manufactured in our factories in China and the Philippines. At the same time Claire, our buyer( and President) is busy photographing new items and sets which have just arrived so we can add or update the pictures on our website. Some of these new items are additions to our Nativity Sets and Outdoor Nativity Scenes as well as a new Toy Soldier. We believe that it is important to continually improve and add to our sets and individual items. We work with our factories and their designers and model makers to create new and improved Wise Men, Angels and Shepherds as well as adding dogs, goats and various barnyard animals and fowl to our Nativity Scenes. On our website, you will now see the various social media icons, including Facebook and Twitter. We hope you will “like” our site and share your photos and stories with us. We will be creating “Tweetable” stories and offers in the next few months as we develop these tools. More on this in our next post.